They are not in any sense our property, to do as we like with. The current fire safety legislation in England & Wales (The Regulatory Reform (Fire Safety) Order 2005 - and similar legislation in Scotland and Northern Ireland) is designed to safeguard life, and makes no provision for building protection. In modern buildings, this is acceptable as it can be rebuilt but it is different with Heritage buildings - once the historic fabric has been destroyed, it is gone forever - History turned to Ashes. ​If your fire risk assessment has not been undertaken by a Heritage Specialist, with an additional level of assessment to protect the building - then quite simply your building is NOT protected! Historic buildings were built in a different era under different rules and without any regard to fire standards. The materials they are made from are readily combustible, often incorporating features which can assist the rapid development and hidden spread of fire. They are used and occupied in ways very different to their original purpose and design, with modern installations and equipment fitted in many of them. Without the right level of protection, this leaves the buildings and their visitors vulnerable to fire. As an owner or guardian of a historic building, you are responsible for the life safety of anyone who visits it or works in it, as well as for the protection of the building and its interior as part of our nation’s heritage, so that future generations can appreciate and enjoy it. ​That is a lot of responsibility! Heritage & Ecclesiastical Fire Protection ​can help you. ​There is no hazard that can threaten your historic building that is as totally and rapidly destructive as a fire. In addition to the serious risk to life, a fire is capable of fully consuming and destroying a building, its contents, and therefore its historic fabric, in a matter of hours. Even areas not engulfed by the flames are seriously damaged by smoke or the huge volumes of water used in the fire fighting operation. You might remember some high profile fires from local or national news reports, but many more fires go unreported by the media. 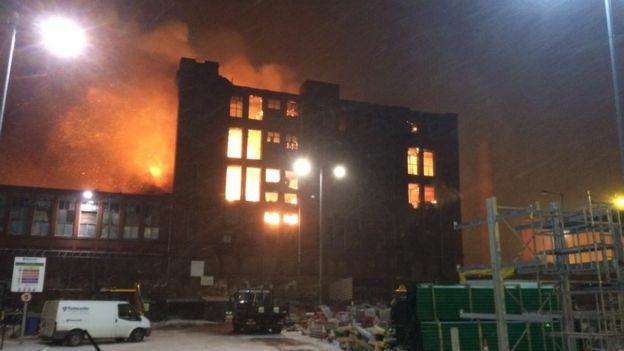 Although fire threatens all buildings and its effects can be disastrous in both human and economic terms, (as we all know from the tragic Grenfell Tower fire), there is a further dimension in the case of a historic building. The loss of the building and its interior is the loss of property that forms part of our national and cultural identity. It is finite and irreplaceable. Once it's gone, it's gone forever and therefore every possible effort should be made to protect and preserve it. Many people highlight cost and disruption as being a reason not to invest in the protection of our heritage, but if we continue to accept these reasons we will continue to see these buildings go up in flames ... and what about the cost and disruption following a major fire? It is, or course, a legal requirement to assess and mitigate your fire risks and to protect life. In order to protect a culturally important property it is usually necessary to go beyond the compliance required by the law, and even by your insurers. Each historic building is unique. To achieve the sufficient level of safety and protection for your heritage asset, you need a specialist heritage fire risk assessor who understands the nature of these buildings. It requires unique and creative solutions of fire protection issues, so you need someone who can analyse and evaluate the problems that exist in your building. Someone who can specify the appropriate package of fire precautions and management actions needed. A Fire Risk Assessment is the first step in fire protection management. ​Heritage & Ecclesiastical Fire Protection ​can provide you with the professional expertise to achieve the enhanced level of compliance and fire safety management your building demands. 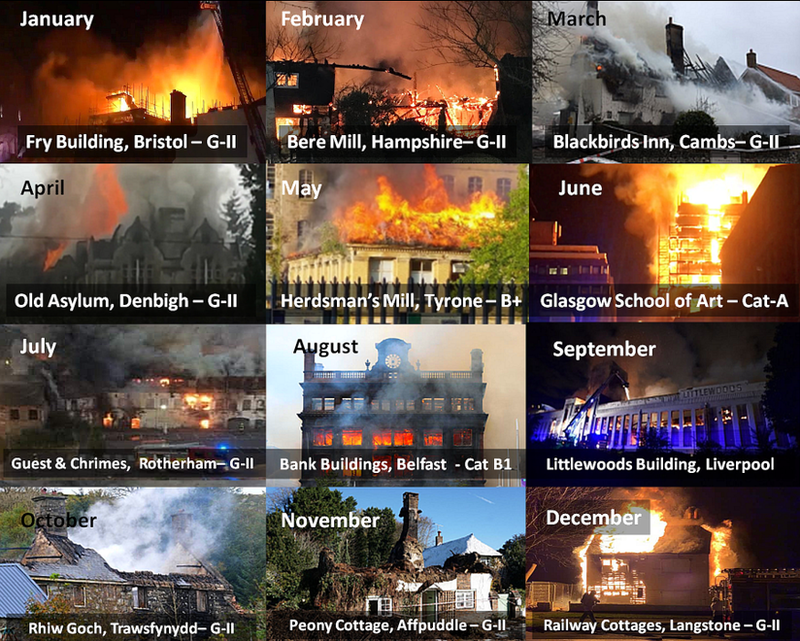 A montage Calendar of some of the major fires in historic buildings in 2018 & 2019.
in their fire safety strategy. Don't let your building be next picture we add!